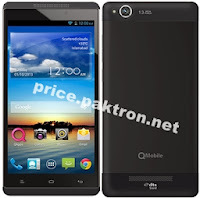 QMobile Noir V5 is a dual sim smart-phone which comes with huge 5.7 inch HD IPS display at 1280x720 resolution. Qmobile strikes yet again Pakistan markets with another brilliant device up it’s sleeve, The QMobile Noir V5 taking the best from all of it’s predecessors the Q Mobile Noir V5 is a uni-body made of aluminium and 7.9 mm slim, also give's you a sleek and premium look specially at the back. QMobile Noir V5 is packed with a 1.5 GHz Quad-Core MT6589t by Media-tek ensuring the best gaming experience that you have always dreamed of. With the latest flavour of Android 4.2 Jelly Bean, coupled with 1 GB RAM and 16 GB inbuilt storage. Noir V5 has a 13 MP camera with auto focus & a front 5 MP camera that give laser sharp images. Noir V5 is two SIM's Mobile enjoying two at one mobile in very reliable price.